Brain-machine interfaces (BMIs) can be used to restore motor function to persons with disabilities. 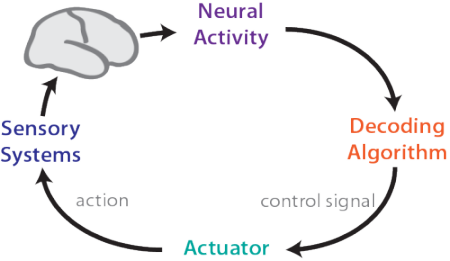 These motor BMIs map recorded neural activity into a control signal for an actuator via an algorithm (the “decoder”). 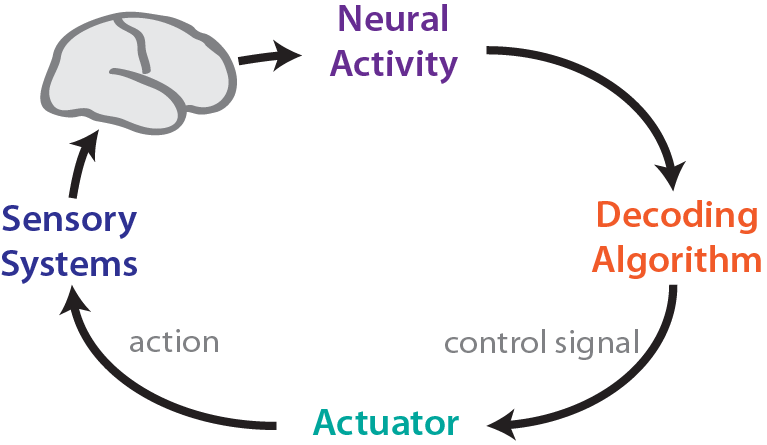 Feedback of the actuator movement creates a closed-loop system, allowing the user to modify their behavior in a goal-directed way. Because of this, BMI performance is shaped by both the decoder and the brain. Both components can adapt, via neural plasticity or adaptive decoding. Such adaptation may be particularly useful for creating neuroprostheses with robust, natural-feeling control. I’m interested in developing adaptive decoding methods, understanding neural plasticity in BMIs, and probing brain-decoder interactions in this “two-learner” control system. Properties of the sensorimotor system, such as temporal delays in sensory information arriving from the periphery and limb biomechanics, strongly influence natural motor control strategies. The same is true for neuroprostheses. Aspects of the “BMI loop”–from the actuator being controlled to the neural activity used for control–may shape performance. I’m interested in understanding how different elements of BMI systems influence control, both to improve neuroprosthetic performance and to shed light on principles of motor control. Electrophysiological techniques can record neural activity at a variety of spatial scales. Action potentials (or spikes) of individual neurons provide highly localized signals. Electrical fields immediately surrounding electrodes penetrating the cortex (local field potentials, LFP) reflect summed synaptic activity of nearby neurons. Electrodes on the cortical surface (electrocorticography, or ECoG) capture activity of larger, more superficial neural populations. These signals reflect different aspects of processing within neural networks, and each have unique properties. Understanding the relationships between scales is an important open question in neuroscience. Moreover, which signals are most useful for neuroprostheses is unclear. I’m interested in developing technology platforms to simultaneously, chronically record neural activity across multiple scales (ECoG, LFP, and spikes), and using these techniques to study questions in basic neuroscience. I’m also actively exploring how the choice of neural signals influence BMI control. Brain-machine interfaces are not only useful for rehabilitative and restorative therapies, they are also tools to study neuroscientific questions. BMIs create novel, functional circuits for action and/or sensation that can be used to study motor skill learning and adaptation. Because these systems are defined by the experimenter, they may also reduce ambiguities inherent in neurophysiological motor learning studies caused by the complexities of the highly distributed natural motor control system. BMIs define a simpler, known mapping between neural activity and behavior, allowing for careful study of neural activity directly and in-directly contributing to behavior. BMI systems can be more readily interrogated and manipulated by the experimenter to provide new insights into the neurophysiological basis of learning and control. I’m particularly interested in exploiting these novel advantages of BMIs to study the motor system.